The Boss Kut Personal Die Cutting Machine is highly engineered for accurate and reliable cutting. Boss Kut offers the versatility of having several sizes of alphabets and shapes. The Boss Kut is easy to use -- no standing, or hurting hands. Whether you are a scrapbooker or crafter on the go, or one at home, the Boss Kut is perfect for you! Do you have a Bosskut Personal Diecutting Machine? 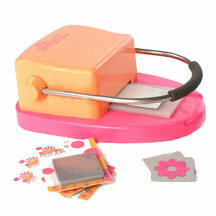 Share your review of the Bosskut Personal Diecutting Machine.